The spruce laminate top gives the Chord Electro-Acoustic Bass Guitar great projection, while remaining bright and clear. Providing a well-rounded, meaty tone from the first time you play it, this wood only improves the more it’s played in. The large body shape provides a deep, booming bass tone and boasts a traditional Super Jumbo acoustic bass cutaway body-shape with massive tone and sound. The cutaway provides easy access to higher frets, accommodating modern playing styles. This acoustic bass is also factory-fitted with a 4 band EQ Pre-amp, (featuring Notch, Brilliance & Phase controls) and on-board guitar tuner - and all this at a really affordable price. 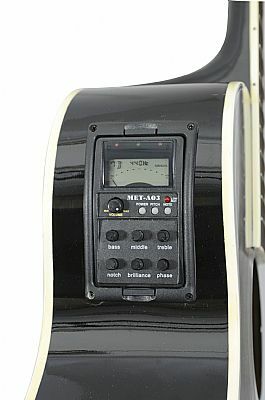 Electro-acoustic bass guitar with 4-band EQ preamp and tuner. Cutaway jumbo body design with spruce top and mahogany back and sides. Long scale neck is mahogany with rosewood fingerboard.